Stozharov subtly felt the perspective in its historical embodiment, understood the traditions of the people. All his still lifes are saturated with rich colors. This is a real celebration of the spirit of the people. Stozharov trowels depicted ordinary objects that were used in everyday life by peasants. In his paintings, we see magnificent toes, ordinary clay pots, patterned towels, spinning wheels, painted spoons, and more. They all stand or lie on a simple table, which is located in a log hut. The viewer can feel the past, which becomes the most tangible and recognizable. When looking at this picture you can feel the rare colorist gift of the artist. His creation is monumental and national. It is amazing how Stozharov prescribes each item. They are so tangible. it seems that quite a bit more, and they materialize. This is the true mastery of the artist. Stozharov lovingly prescribes all the details of the usual life of the peasants. You can see all the roughness of the rough table. The folds of the embroidered towel are extraordinarily real. All dishes surprise with rich colors. We feel that the artist liked to paint still lifes on the subject of everyday life. He skillfully finds beauty in ordinary things. Depicting ordinary objects, he creates a real masterpiece, striking the grandeur of design. 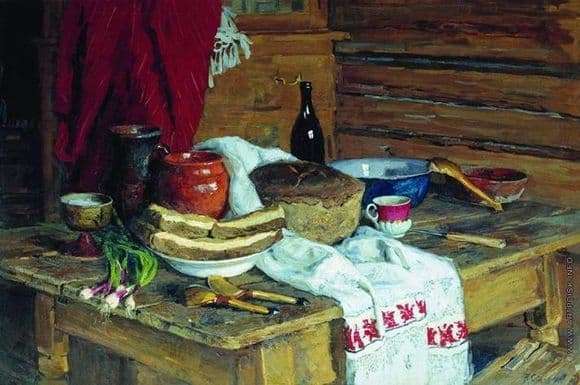 Stozharov uses rich colors. His still life, as if from the inside, is filled with light. The audience does not have a depressing impression, even though the life of the peasants was rather joyless. We can feel only the joy of the artist, who is proud that he is a Russian. We are unwittingly transmitted this high spirits. Still life of the artist I want to consider as detailed as possible, since this picture helps to understand the essence of the Russian character.